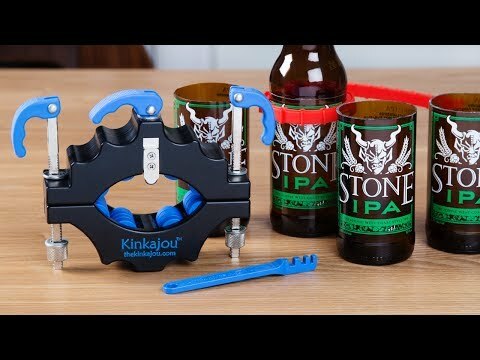 This bottle cutter turns your average bottle into a vase, votive, drinking cup, or candle holder in three steps. Score, separate, and smooth the glass into all sorts of creative DIY projects. Cuts round bottles from 43 mm. to 102 mm. Bought for my husband for xmas, he just tried it out. It worked and cute the glass. He is happy with it. I purchased the bottle cutter and had been collecting bottles. When I finally had the chance to begin cutting, The instructions say that many more items were needed than I had on hand. I thought I'd remembered reading "all you need to begin," but I must not have. The price of the two sanders and sandpaper was pretty shocking: $70, with shipping. Not as easy as they make it sound. Equipment is well made and the concept is good but it is very difficult to make the cutter travel the circumference of the bottle and end up where you started. If you tighten the clamps too tight it is very difficult to turn the bottle, but if you loosen them then the clamps move on the bottle and you lose your straight line. This easy-to-use bottle cutter transforms your bottles into a vase, votive, drinking cup, or candle holder . . .
Upcycle in just three steps. First, score the bottle, then separate the pieces using the silicone band. Lastly, use the high-grade sand paper to smooth to perfection. 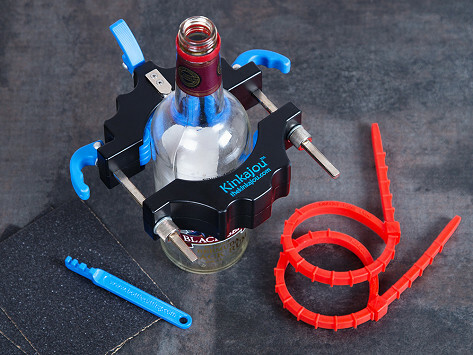 Much like the little Kinkajou animal, this bottle cutter is compact but efficient. We tried it out here in the office and found the process straightforward and also super convenient. Start collecting bottles—this small hack opens up the possibility for all sorts of do-it-yourself projects.